I'm loving this casual outfit for Valentine's Day! It's so chic and the faux leather leggings make it a bit edgy. Many dinner places aren't fancy enough for a dress (this is the case in my area), so a sweater, leggings and over the knee boots make a great Valentine's outfit choice. There are SO many cute dresses out there if you have fancy V-Day plans, though! I love these dresses- here, here, and here. So, what are your Valentine's Day (or maybe Galentine's Day) plans!? Todd and I have dinner reservations at a local place that we've been meaning to try for while!! The entire look is my style. Great details on the OTK boots. I really love that bag!! AHH me too!! I fell in love with it when I saw it at Ann Taylor. It was out last spring so it's not available anymore...Boo. Thanks for the comment, Darcy! GIRL you look SMOKIN!!! love the color of that sweater, the leggings, the boots. LOVE IT ALL! Love your pretty sweater mixed with the edgy leggings! Those OTK boots are fab! Wow you look amazing! 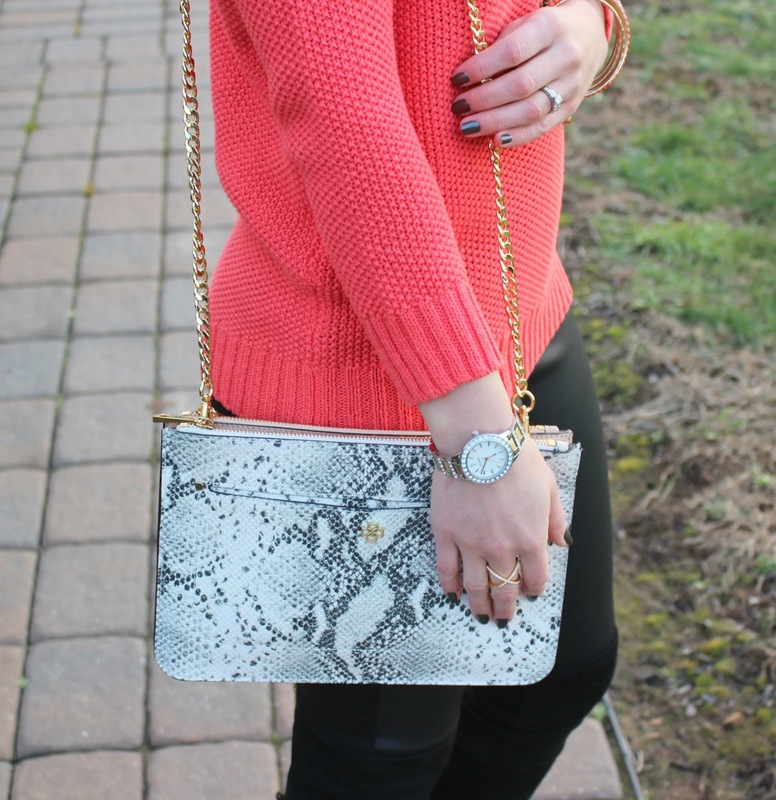 IN love with this coral knit sweater! I LOVE THIS. So pretty, and those boots!! !